Use the March calendar to keep track of the weather and practice basic calendar strategies. Enjoy a shared reading about the March weather. 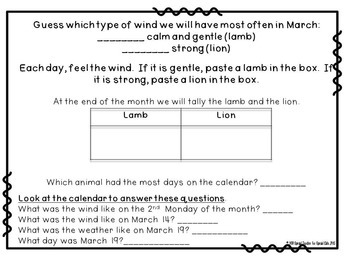 Predict what will have the most at the end of March, lion or lamb days. 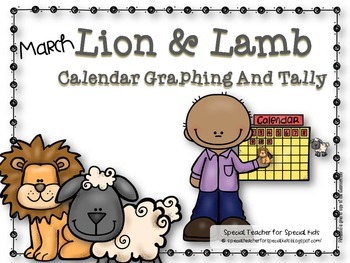 *March calendar with lion and lamb pictures to glue on the correct day. 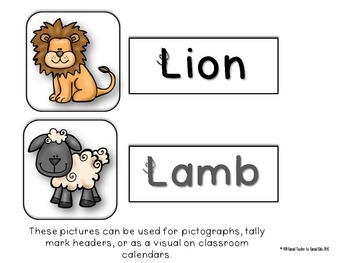 *Large lion and lamb pictures for class graphing or use them on the class calendar. *Large size shared reading about March weather, also student size of the shared reading for highlighting and word identification. Please consider leaving feedback after downloading this product. If you feel this resource does not deserve a high rating, please leave me information in the Q&A BEFORE rating the resource low. Leaving feedback allows us to keep our materials up to date and you earn TpT rewards. Don't forget to follow the Special Teacher for Special Kids Teachers pay Teachers store for new products and notifications of product revisions and additions. Be sure to check out the sites below for more freebies, links, and ideas!